You’re looking at my side hustle. A medical student shared his various side hustles not long ago, and my WCI Network partners each have successful side hustles of their own. While you may not think side hustles are for physicians, more and more of us are looking to do something different. Some side hustles can become main hustles, and that will soon be the case for me. Today’s post from Passive Income MD discusses the challenges we face pursuing paid work outside of clinical medicine. This post originally appeared on Passive Income MD. The idea of a side hustle seems to appeal to most people I talk to. It’s a great way to learn new skills, supplement your income, and build streams of passive income — all without quitting your day job. And as evidenced by the discussions in our Facebook group, many physicians also love the idea of a side hustle and gaining passive income. Honestly, who doesn’t? However, despite their apparent desire to pursue a side hustle, plenty of obstacles seem to stand in the way for physicians. The same issues seem to pop up again and again, keeping many physicians from realizing their passive income potential. Here are some of the big ones, as well as some things to consider about each. We already feel overworked as physicians. Residents are working 60-80 hours and attending physicians’ hours don’t seem to be much better. Even when we’re not seeing patients, we’re spending an extraordinary amount of time on paperwork. Many barely make it home to see their families in the evening. How can we possibly find time for a side hustle? There simply aren’t enough hours in the day. I started with this one because it seems to be the biggest challenge in the physician life – finding time to not only be a physician but also to pursue other meaningful things. Therefore, this is an entirely valid argument. However, for many of us, if we take a hard look at our daily routines, we might just be able to create some more time. How do we do that? Well, one thing I’ve mentioned is to perhaps find ways to outsource activities and errands that we don’t enjoy, in the form of paid help, like a virtual assistant or someone from TaskRabbit or Fiverr to perform a service. Another way is to perhaps reprioritize how you’re spending some of your time. I’m not saying that you shouldn’t binge-watch Game of Thrones or Black Mirror, but how you spend your time reveals where your priorities lie. If it matters to you, you’ll find time for it. Despite steadily dropping reimbursements, physicians consistently top the lists of highest salaries in the U.S. We make a decent living. Are there really side hustles that exist that provide anywhere near the amount we’re making as physicians? Can a side hustle provide the kind of financial security that we’re looking for? Why even start a side hustle when you can just work a little more as a physician and likely get paid significantly more? Another valid point, especially when starting a side hustle. It’s true – many of us will not be able to find side hustles that compensate us as well as our physician salaries do. However, it’s also true that we as physicians are trading precious time for money. There is very little opportunity to scale our income, meaning that in order to make more, we have to put in more time. But with some side hustles, the opportunity to scale is there, and ideally, these side hustles will lead to truly passive income. Just check out my True Doctor Stories for examples of physicians who have found some of those profitable side ventures, like this one of Dr. Jim Dahle. Sure, that stream might be a trickle at first, but the income potential in some of these side hustles is limitless. One day, they may even make your physician salary look small. As physicians, we’re trained for one specialty. Even if we want to venture out, medical school doesn’t prepare us for the realm of business, and many of us don’t know where to start or what to do. Our path to our specialties has been pretty clear-cut – get into residency, do a fellowship, and get a job. The truth is, many successful business owners had little to no expertise in their exact business sector. They just figured things out as they went. They googled things, they found mentors, they tried and failed. But they got back up every time. Just listen to the How I Built This podcast, and you’ll hear amazing stories of entrepreneurs who started with just an idea. Largely through trial and error, they figured it out and formed multi-million dollar companies. Having a base of knowledge is great, but it’s not a necessity or indicator of success with a side hustle in any way. Physicians are fairly risk-averse people. Everything we do in our daily lives involves a risk-to-benefit analysis. In fact, many of our clinical decisions are made to minimize risk, not necessarily for maximum benefit. This carries over into other parts of our lives, particularly when it comes to investing or having side hustles. Many of us fear that the risks simply outweigh the benefits and that keeps us from starting a side hustle. However, perhaps we should be considering the risks of inaction. The real risk is doing nothing and expecting medicine to give us the lives we want, whatever that means to you. Is it possible that you could fail? Possibly. But how would your life and the lives of your family be improved if you were no longer dependent on trading time for money? 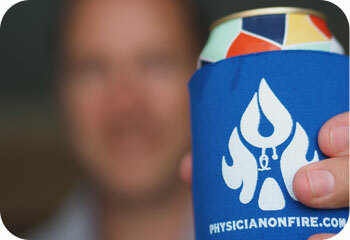 how can i fail when i have logo koozies?!? Being a physician can be mentally and physically draining. You give so much and at the end of the day, there just isn’t much left in the tank for anything else. The last thing you want to do is think about another venture and have it keep you up all night. Those trying to juggle family and jobs feel the exhaustion on a daily / weekly basis. In the selection process known as “Hell Week”, Navy Seals are pushed to the point of complete exhaustion and then are pushed harder. They force people to tap out. However, those who ultimately make it into this elite force are the ones who find that extra determination when everyone else is giving up. They realize strength they didn’t know they had. Ultimately, I think this is part of what separates those who successfully create side hustles and those that don’t. Every successful entrepreneur seems to have a story where they were pushed to the edge and perhaps thought of giving up but endured. It may not be easy to dig and find that extra motivation and energy, but for those that do, it could be worth it in the end. Physicians have to devote a lot of time, energy, and brainpower to excel in their fields. The last thing they want is something that takes away from that. Being a physician requires constant studying and staying up to date on current literature. Have a side hustle could be a distraction from being the best physician that you can be and the desire to be as well. It is possible that a side hustle can be a distraction. I’ll be honest, when I leave work, my thoughts immediately turn to my family first, then side hustles second. I try really hard not to let any side hustle take away from my day job. Although when I leave work, I love the fact that I have something else to focus on. In some way, it may not be healthy to always have the day job on the mind. I’ve found that these side hustles are an amazing way to stretch and use different parts of my brain that I may not have used before. It keeps my day job fresh in a way because I’m not always fixated on it. Then again, it’s all about priorities. If your day job demands all your focus and if that’s where your priorities are, there’s nothing wrong with admitting that perhaps a side hustle isn’t right for you. Physicians are bound by ethical and moral rules to do best by the patient. It’s important for these potential conflicts of interest to be recognized so that decisions for patients are made appropriately. If a side hustle you’re considering does contain a conflict of interest, then it’s probably best that you figure out how to deal with that ASAP – by either quitting your day job or quitting your side hustle. There are many, many ways to accomplish the passive income dream without causing any undue stress and conflict. Many people love the idea of having a side hustle but can’t figure out which one to pursue. Nothing seems to fit within their passions, or perhaps nothing seems to gel with their personality. All that brainstorming seems to only lead you to dead ends. In reality, sometimes finding that first idea is the hardest part. However, there are ideas all around. Perhaps expectations are keeping you from honing in on one. Maybe you’re waiting for the perfect idea. But the “perfect idea” doesn’t exist. It’s very, very unlikely that a single idea will be one that you’re perfectly interested in, have a passion for, have expertise in, and makes a lot of money without any effort. The best thing is to grab at an idea and make it into the perfect idea. Shape it the way you want, even if it doesn’t appear perfect at first. Is a Side Hustle in Your Destiny? I’ll be the first to admit that having a side hustle is not necessarily for everyone. But it’s also true that everyone can have one. It’s just a matter of having the right mindset, making it a priority, committing, and just going for it. If it fails, get back up and try again. Many successful entrepreneurs have failed miserably, and they credit that failure for making them the massive successes that they are. If you think having a side hustle can make a positive difference in your life, you have to ask yourself: are you letting obstacles and roadblocks get in the way? If so, identify them and overcome them. You’ll be glad you did. If you’re interested in discussing side gigs and related money topics with other physicians and belong to Facebook, join in the ongoing discussions in these fine groups. Not a physician? While these groups aren’t side gig focused, you’ll find some good discussion among high-income professionals discussing personal finance in these. Do you have a side hustle? What are some of the obstacles you’ve faced in having a side hustle? A side hustle certainly can add more to your plate and if you are already feeling burnout from your primary job this may push you over the edge. For me, starting a blog almost has the opposite effect. Even though blogging is quite time consuming (it is amazing how I took that for granted before as I now know what kind of time is required to put out a post that can be read in 5 min). Even though blogging has taken up a lot of my time, because I it is something I really enjoy it has ignited a spark and sort of helped reverse my path to burnout. Even though the financial return/time unit is miniscule compared to my main gig, I get more excited about this small amount than I do from my w2 wage. It really drives home the point that if you are passionate about something it doesn’t feel like work. I think that’s the trait the best side hustles share. It should energize you and ignite a spark of passion that you may have lost in your main job. Don’t make your whole life about medicine. You need some type of other activity, such as gardening, music, woodworking, photogrphy, or blogging. It doesn’t have to make money, that’s just an added bonus. My favorite question to ask docs, “Would you keep your current job if you were not paid?” Can you guess the answer? Many side gigs go unpaid yet provide immense satisfaction. For some, medicine continues to be a calling but for everyone one else it is more like a job. I used to love practicing medicine but lately I would rather spend time with my family and pursue the side gig. The obstacles sometimes get in the way but I look at it as a marathon and not a sprint. I wonder if I will continue working if I no longer need the income? If I had to choose and money didn’t factor in, I will choose the side gig every time. Nice post. Thanks for trailblazing for the rest of us! Side hustles have been an excellent source or extra income and experience for me! I highly recommend at least giving one (or a few) a try. They come in so many varieties, most doctors are bound to find one that resonates with them. If you try out a hustle, but ultimately decide you want to rock your full-time job and save the rest of your time for fun and personal pursuits, that is okay! I agree with Cory (above). Hobbies are very important! I have sold some of my photography through iStock, and that is very cool, as it feels very “professional.” But it certainly isn’t worth the effort from a financial point of view if you take into account the equipment, effort, travel, contracts, etc! But it’s still fun! Writing for me is more than a “side hustle,” or hobby, more like a second career (that doesn’t pay very well!). Maybe someday I’ll write a bestseller! It is all about how balance and what you and your family can handle. I work 20 hours at my W-2 job with benefits, 8 hours every other week at another job, and I have a private practice, one day a week. So far I’m loving it. It is all about balance and what you and your family can handle. I work 20 hours at my W-2 job with benefits, 8 hours every other week at another job, and I have a private practice, one day a week. So far I’m loving it.